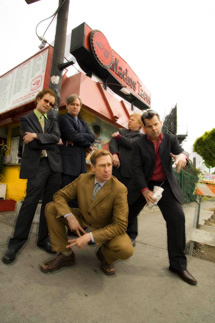 I’m pretty geeked about the current Kids in the Hall tour, and the fact that I actually have a ticket in hand for their May 29 show at the Chicago Theatre. I’ve never gotten to see them live before, because on their previous trips to Chicago I was always performing with the Neo-Futurists or something else I couldn’t get out of. But the new stuff was some of the strongest material. The most inspired sketch of the night had Foley confessing to McDonald his suspicions that his imaginary girlfriend was cheating on him. McCulloch’s song tracing his dancing technique from eighth to 11th grade was a wonderful bit of silliness, and a three-sketch arc about a time machine helped tie the night together. The Kids were confident enough in one of their new characters to start the merchandising early – you could buy a beer cozy for “Super Drunk” in the lobby. Best of all, it was obvious the five Kids still enjoy writing and performing together. Several times during the evening they cracked one another up, flubbing lines or improvising to throw someone off. When Thompson’s headset mike wouldn’t stay on in one scene, it became a running gag – Foley, McKinney, and McDonald imitating Thompson’s attempt to keep his mike close to his mouth with a fingers-on-the-cheek Jack Benny posture. The 90-minute show moved quickly and ended at the perfect length – and on the perfect note, with McKinney’s Headcrusher dispatching the audience and the troupe. The Kids do have plans to continue working together after this tour ends in June, possibly on a film project. And if they’re still having this much fun, it will certainly be worth watching. It always has been. Oh, and hooray film project. I’m enough of a die-hard fan to have enjoyed Brain Candy, even though I recognize it wasn’t their finest hour. But I also think they learned a lot from that experience, and won’t repeat some of the mistakes that hobbled that project creatively. ( “Everyone has to agree on every page of the script” system, I’m looking at you. *) Plus, they’ve got lowered expectations on their side this time! You can’t buy that sort of advantage. * “Having Brendan Fraser in the movie but not having him take off his shirt,” I am also looking at you. I loved TKITH…they were my favorite thing about my 20s! I’m so glad they still work together! My favorite character/bit in that movie was actually Bruce as Cisco the bitchy self-impressed marketing guy, and the way he holds court in the meeting with all the suits. Just perfectly captured.